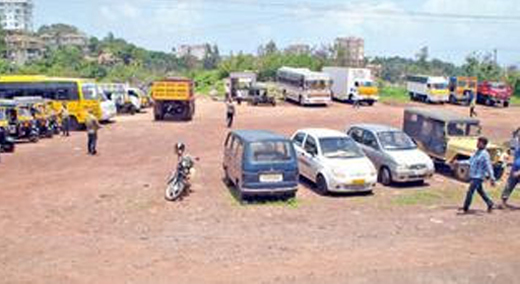 Mangaluru, June 16, 2016: It is good news for the local people, finally, the RTO, Transport Department has got a suitable location and space outside the central business district of Mangaluru to conduct inspection of commercial vehicles. The district administration allotted 1.19 acres of land between SKS Planet and KPT on NH 66 to the Transport Department recently for the purpose. The department has shifted inspection from its temporary venue, Bangra Kulur, to the new place. Hundreds of commercial vehicles enter daily, into the premises of RTO, Senior Regional Transport Officer near A.B. Shetty Circle, opp Nehru Maidan, for inspection and for getting fitness certificate was definitely responsible for chaos in the heart of the city. The district administration had been cautioning the department to shift out, , but it was not happening for want of land. The district administration temporarily allotted about 2.5 acres of land at Bangra Kulur to the department and the inspection was shifted to the location in January 2016. However, the land thereafter was permanently allotted to the Sports and Youth Empowerment Department forcing the RTO to scout for new land. In-charge Senior RTO and Deputy Commissioner of Transport G.S. Hegde stated that the records of 1.19 acres of land had been transferred to the Transport Department’s name and the inspection was shifted to the new place from June 3, 2016. Now with the land in the Transport Department’s name, it would be easy for the department to provide certain basic amenities to the staff as well as the visitors. His office would write to the headquarters seeking funds to provide shelter, rest rooms, drinking water and other amenities even as there are plans to protect the land with boundary walls. RTO Hegde said the new venue was closer to the city than the Bangra Kulur premises. This is the most wanted in the city because the RTO office presently located at the heart of the city and there is traffic jam due to this.